We live in an age of fast forwarding through commercials, free 2-day shipping, and 140-character messages. The church season of Advent invites us to be patient and attentive. This Advent our worship theme is “Love, the guest, is on the way” as we journey through the scriptures and the powerful lyrics of Advent hymns. Beginning on Sunday, November 20 in Reed Hall you can pick up a copy of the Advent devotion, Songs for the Waiting by Magrey DeVega. It will be our guide to the anticipation of and preparation for Christmas. The daily devotional is $10, and can also be pre-ordered online at westendumc.org/advent. This Advent our worship focuses on powerful lyrics of the season’s hymns. A companion 4-week study on the Advent hymns is available for all groups to use. Each Sunday morning class is invited to join this church-wide study. Join a three week small group study this Advent that focuses on the unique way each of the Gospels prepare us for Christ’s coming. Each week we will reflect, discuss, pray, and seek to be transformed through spiritual practices. The study begins Wednesday, November 30 at 6 p.m. in Room 310. The cost of the book, Awaiting the Already, is $10. 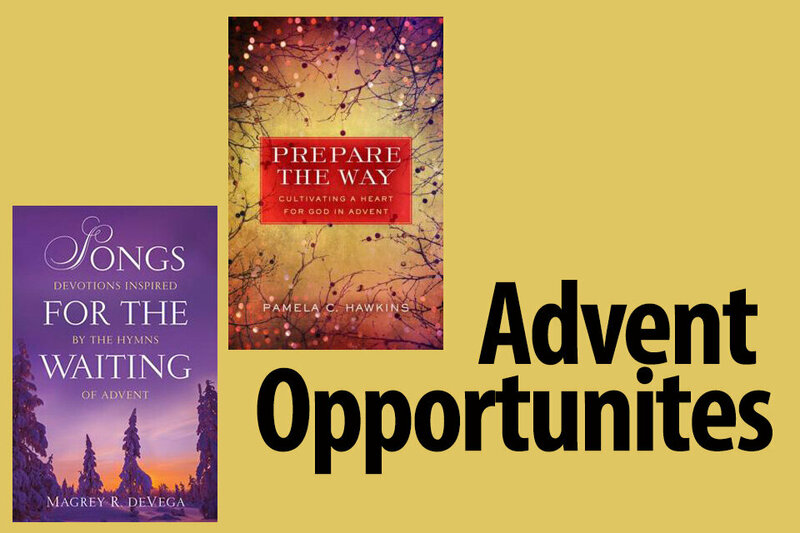 Join us on Tuesday mornings from 10 to 11:30 a.m. for an Advent Study based on the book, Prepare the Way: Cultivating a Heart for God in Advent by Pamela C. Hawkins. Led by Lisa Gwock, the study will meet on November 29, December 6, 13 and 20 in Room 306. A brief informational meeting will be held on November 22 in Room 306 to give an overview of the study and receive a copy of the book. You can register and purchase the book online at westendumc.org/preparetheway or can be downloaded from Kindle for $10.00. If you cannot attend the orientation or have questions, please contact Lisa at lgwock@westendumc.org to arrange for pick-up of a copy of the book before November 22.